Crafty Cakewagon!! 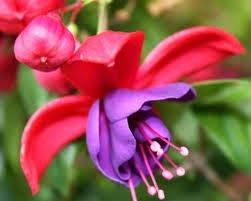 : Fuschia Sale This Saturday! This Saturday, April 12th, is the annual Fred Meyer Fuschia Sale!! Not only are these shade-loving plants on sale, there are piles and piles of them to choose from. And... if you bring your own pots, they will plant them for you, with their own potting soil! Did you catch that?... FREE DIRT!!!! I will be there, lined up probably mid-day, with lots of little old people for free dirt! They will also pot anything else you buy; and of course there are edibles and all sorts of Spring goodies for sale too. If you like free dirt and cheap flowers, you should totally be there! Alice in Wonderland Garden Update!